Traditional perfume is a liquid that can be sprayed or dabbed on, but solid perfume tins offer many benefits. Solid perfume provides control in application, convenience and portability. 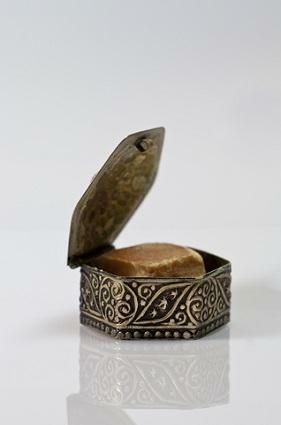 Solid Perfume emits the same scents as traditional perfume, but it is solidified through the use of wax and cream bases. Solid perfumes are typically stored into tins, similar to those used for lip gloss and other ointments. They have been used since ancient Egyptian times, but have experienced a resurgence in recent years. Apply solid perfume in the same spots you would normal perfume: on your wrists, behind your ears, or other pulse points. One disadvantage is that it typically doesn't last as long as regular perfume, but the portability of the tin allows you to take it with you in your purse or pocket. You can easily reapply throughout the day. Another disadvantage is that you can't scent your hair with solid perfume as with spray perfume. If you prefer not to dab your fingers into the fragrance, which can leave oily residue, try purchasing a stick applicator or a roll-on tube of perfume. They provide the same benefits of easy application and portability without having to wash your hands afterward. Estee Lauder is famous for its beautiful and ornate solid perfume compacts. Limited editions are released each year, making them ideal for gifts or collectors. Several fragrance houses have come out with clever solid perfume containers that also function as jewelry. Marc Jacobs' Daisy and Jean Paul Gaultier CLASSIQUE are available in a necklace format. The DKNY Be Delicious tin hooks to your keychain for the ultimate in portability. Kat Von D has created a solid perfume ring that resembles a black rose, and Marc Jacobs' Lola is available in a multicolored ring that also resembles a flower. These creative tins ensure that you'll always have your solid perfume on hand for touch ups.